Seasonal photos separate the year for easy quarterly scheduling. Color scheme accentuates quarterly division and complements photos. Holidays appear in an alternate color for quick reference. 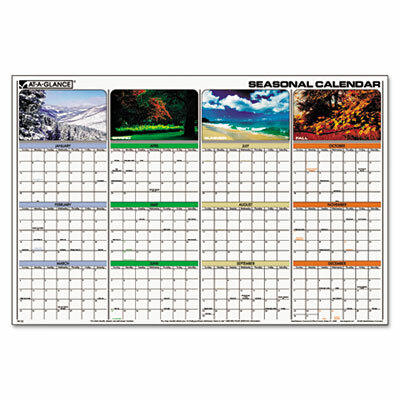 Seasonal photos separate the year for easy quarterly scheduling. Color scheme accentuates quarterly division and complements photos. Erases easily with a damp cloth. Choice of vertical format on one side or horizontal format on reverse to fit your office space. Holidays appear in an alternate color for quick reference.